Whether you are setting up a new client licence or want to add services to the licence of an existing customer, you can easily do so within the Member > Licence section of Operate. Read more on how to set up a new client licence. You can add services to a License regardless of whether it is active or not. Find the licence you want to add the product/service to. Click the Licence Name to access the licence detail page. Click Edit to edit the licence. Scroll down to the bottom of the page where you will find the Office, Virtual Services and Contract Services Schedule sections. The first element that you can add to a customer licence is office space. You can add a new Office from the licence detail page, under the Office Schedule section. Select the Office you are renting - use the Search box to find it in your list of products. This picks up the products that are listed under the Office product type. If a customer is renting more than one office space (two product items within Operate), then you can bundle them together by selecting another office under the Bundle With list. Add the number of Actual Workstations. Add Reference Text as needed. In the example you can see in the screenshot below, we have used <FROM> - <TO> to pull the dates between which the space is being rented. This can help when creating reports. Choose a Start Date - Add the date from which the office is being rented. Choose an End Date - Add the date when the lease ends. Add a Billing Schedule - This represents the frequency with which your customer should pay the fees corresponding to the office. Please note: When you change the schedule from monthly to any of the other options, the product's list price becomes the price charged for the selected period. You can see the product record for exact pricing information and you can adjust the price manually if required. Add the Deposit Held for the office, if you have requested one from the customer. Add any Additional Deposit Required. Use the Comments box to add any relevant information for the office. Check the Anniversary checkbox if you want the customer's billing date to be the same one as the Licence Start Date instead of the first day of each month. Your billing schedule below will update accordingly.. Check the checkbox if you want to Prorate the 2nd Payment. Choose if the office price should Auto Escalate -It’s important to make sure that this checkbox is checked if you intend to automatically increase pricing on the licence and the price of this office should increase as well. Check the Schedule - The Schedule breaks down the period that you have selected above (between Date From - Date To), in periods corresponding to the billing schedule you have selected (e.g. : months). 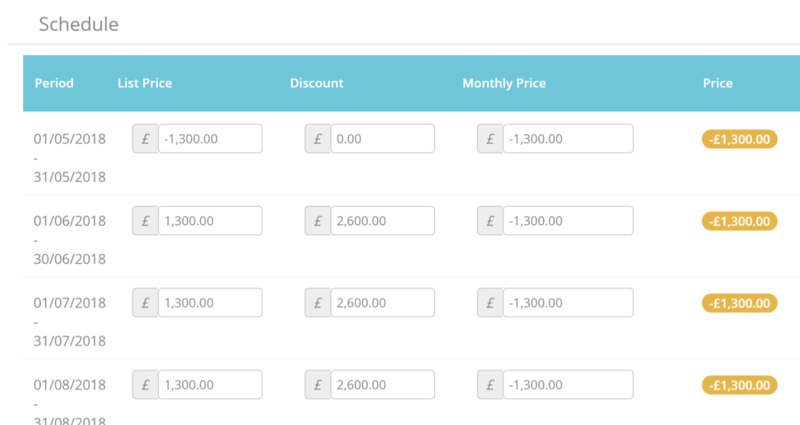 Here is where you can edit the price for any particular period and tell the system if the period has been already billed for (using the Invoiced checkbox). Check the Totals and Advanced Billing section to make sure your total price is accurate. Here is where you can also decide to bill the customer for a certain number of months in advance. Virtual Services are designed to be used on licenses that you set up for virtual customers. This type of customers generally requires communication and address services for a fee, without any dedicated office space. You can add Virtual services from the dedicated section on the licence detail page. Select the Virtual Service you are providing through this licence. Bundle it with another service as needed. Bundled products will be invoiced together, but will be kept separate in other documents such as charge sheeta. Add Reference Text as needed. In the example you can see in the screenshot below, we have used <FROM> - <TO> to pull the dates between which the services are being provided. This can help when creating reports. Add the Tax that applies to the virtual service. Choose a Start Date - Add the date from which the service is being provided. Choose an End Date - Add the date when the service ends. Add a Billing Schedule - This represents the frequency with which your customer should pay the fees corresponding to the virtual service. When you change the schedule from monthly to any of the other options, the product's list price becomes the price charged for the selected period. You can see the product record for exact pricing information and you can adjust the price manually if required. Add the Deposit Held for the service, if you have requested one from the customer. Use the Comments box to add any relevant information for the service. Check the Anniversary check box. Choose if the service price should Auto Escalate -It’s important to make sure that this checkbox is checked if you intend to automatically increase pricing on the licence and the price of this service should increase as well. Select the Service you are providing through this licence. Make sure to Save your changes to the licence when you are ready. Please note that when applying discounts on a Licence item, it will apply to the full price of the office or service and not to the month's charge. Therefore, if you have a prorated charge, the discount cannot be applied to it. The calculation is List Price - Discount = Monthly Price (to which the prorate applies). Please also note that If your Licence is running over an extended period of time, your office and service pages will filter charges by year. Please read this article to learn more. If you need to add a Licence that contains office space or services that have been already billed for a certaIn period of time during the Licence Agreement, you can bill them in arrears by adding a negative value within the List Price field on the Licence Item Schedule. Please note that when you edit one month's price, Operate will automatically enter it for all subsequent months. So, please leave the negative amount for the number of months you need to bill in arrears, then enter the desired positive amount starting from the month that you do want to bill. In the screenshot above, you can see a negative amount for the first month, then all subsequent ones are in positive price amounts, so will be billed normally. Please note: Offices will appear as occupied within the Occupancy Forecast Report as long as there is an active Licence that relates to them. If the Office no longer represents the object of a Licence, it is not enough to delete the Office item from it - this will not remove the Office from the report. You will need to terminate the Licence and create a new one under the new terms, to allow Operate to show your Office as unoccupied.